Yesterday was the start of our first 2016 Bali By The Backroads Tour. We have 11 Kiwis here in Bali with us all looking forward to nearly two weeks zipping around this scenic island on motorbikes with us. Today was our first day out on the bikes. First up we had to battle a bit of traffic to leave the busy south western part of Bali. Soon the traffic thinned and we were heading north towards Ubud. We even managed to get in a bit of 'offroad' riding. You can't go to Bali without checking out at least one or two temples and Mengwi is a rather beautiful one that is well worth getting off the bike to have a look at. Our lead rider for the first four days of the tour, Wayan Lega, took us down some great little tracks through rice paddies and fields. We had lunch at Cafe Wayan, an original Ubud restaurant and one of our favourites. And then the rain came in great big drops so we headed for our hotel taking some winding back roads up and down ravines to avoid the post lunchtime traffic that happens in Ubud every afternoon. A great day was rounded off with dinner at unique restaurant built almost entirely from bamboo. Tomorrow it's back on the bikes for some more adventures on Bali By The Backroads! Keep checking back here to see what we've been up to. Last week we were in Gisborne, then Te Puia Springs, Hicks Bay, Tokomaru and then back to Gisborne again. Why? We were there for our Yamaha East Cape Capers Trail Adventure, and along with us were a bunch of keen adventure-trail riders. Yes, there was some rain and the title of this post is probably not that accurate (not the Dusted bit anyway). Some rain did not stop the group from enjoying the four days of east coast tracks and trails, and on the final day the weather was magic . From rugged farm station tracks, forestry trails (complete with rising rivers), to riding magnificent empty east coast beaches - there was plenty to experience..
Everyone had a fantastic time and the East Coast welcomed us as only the East Coast and the down-to-earth locals can. There were many laughs including the hard-case breakfast waitress at Hicks Bay who declared any man not having a cooked breakfast as having "a kiddies breakfast". Then there was the dog running around dining room in Hicks Bay with a pair of men's boxer undies dangling from his teeth. As our group had riding gear and other stuff strewn all over the back porch of our accommodation we could not be certain the undies did not belong to one of our group - though no one owned up! It was a quick turnaround when we got back home on Wednesday. Unload van, wash and service bikes, wash riding gear, and repack bags. Then on Saturday Mike set off for the Far North to pre-ride the route for our Yamaha Northern Exposure Trail Adventure with our lead rider Mike J.
Riders will arrive at our Kahoe (just a bit north of Kaeo) base on Wednesday evening or Thursday morning. It's time for four days of varied and scenic riding from the north Hokianga in the west, to almost the top of the Aupouri Peninsula in the north, Totara North in the east, and lots of Far North hinterland inbetween. Following the Yamaha Northern Exposure ride it is another quick turnaround for us. Three days after returning to our HQ in Hamilton we fly out to prepare for the first of two 2016 Bali By The Backroad tours . . . . just in time to escape the increasingly cooler weather. During our time in Bali we will endeavour to do regular blog posts on our adventure so keep an eye out if you are interested. If you're out on your bike this autumn and winter please take it easy and ride to the conditions - stay safe out there. The steep hills on the Napier-Taupo highway were alive with the sound of motorbikes last Saturday 5 March. The Yamaha Mighty Mohaka Adventure ride attracted 70 entrants with the majority opting to do the trail-adventure route that took them into the aforementioned hills. The sun shone and there had been sufficient rain the week prior to ensure our forestry permits remained valid. Everything lined up for a fantastic day of adventure and adventure-trail riding. Ten or so bikes, most of them large dual-purpose adventure bikes including two with pillions, set off the big bike route. Their route was almost an entirely separate one to the trailies, with all riders coming together at lunch to swap stories of the the morning's ride. The Big Bike Adventure Route included some winding forestry trails and took riders through some scenic inland Napier high-country stations. Some of the rugged hills that flank both sides of State Highway 5 were included in the adventure trail route, and the steepness of some of the tracks ensured that this was not for the fainthearted. Two young women on the ride, both novice motorcyclists with varying offroad experience, did extremely well and finished the day. They wisely opted to miss the 30km optional loop prior to lunch, a good decision given that it caught out many seasoned riders. When Mike advised that this loop would take approximately an hour and a half sceptic looks were observed on some riders faces. However, an hour and a half was pretty spot on for most, and some took a fair bit longer! “Thanks for the wonderful Adventure in the weekend, as a nearly 53 year old desk jockey I did actually feel the full effects of the Adventure Ride, the challenge of self navigation coupled with some riding challenge (all sections were rideable) fantastic food and weather made for a great weekend riding and catching up with good mates. We would like to say a big thank you to all those that joined us at The Yamaha Mighty Mohaka Adventure, and to our fantastic crew Clayton, Richard, Glenn, Bernie, Bruce, and Pesky. They're here! The new line-up. Mike set off yesterday afternoon to negotiate the madness that is Auckland traffic and pick up three new Yamaha beauties. On Friday we're taking the bikes down to the central North Island region to recce the route for the Yamaha Mohaka Adventure Ride (March 5). Our great crew, Clayton and Richard, have been getting out doing some course setting for the ride and Mike is heading down to check out their handiwork. Next time we put a pic up of these bikes they'll likely be quite a bit dirtier! After Mohaka it will be time to show the Yammies some more of New Zealand's amazing scenery when we head down to the Masterton region to set-up the route for the Yamaha Wicked Wairarapa Trail Adventure (10, 11, 12, 13 March). This is a brand new event destination for Britton Adventures and we are looking forward to checking out this splendid area. That's all for now. Watch out for our post after Mike has done the Mohaka recce. The fleet has gone ... so we are going to get a new one! Our previous fleet of Yamaha Motorcycles, 3 x WR450FE, have all gone to new owners. We know they will be well taken care of in their new homes, and will get plenty of exercise and fresh air. 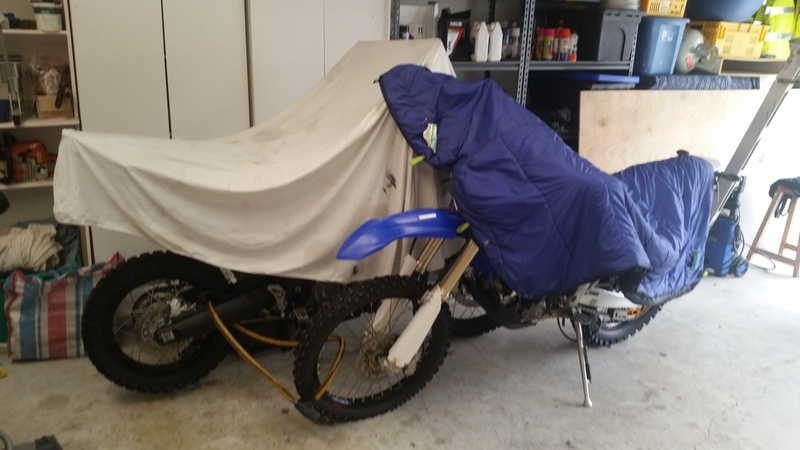 There's still one of the 450's in the garage waiting to be picked up but when that goes, along with our own XT660 (yes we've sold that one too), our garage will be bare. XTZ660 and last WR450 huddle together in the garage. Fortunately there are a couple of WR250F's waiting at Yamaha HQ to be assembled for us. No pressure, Phil, Dave, whoever, but can we have them ready to ride yesterday please, we've got some work for them!